Dickens adaptation The Signalman and two films based on original scripts make up our third collection of Christmas ghost stories from the BBC. 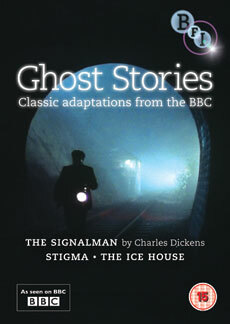 This BFI collection of Ghost Stories from the BBC includes 1976's The Signalman, 1977's Stigma and 1978's The Ice House. Although most films in the series were based on the works of MR James, The Signalman, was scripted by Andrew Davies (Pride and Prejudice) from a Charles Dickens story, while the last two films in this volume were based on original scripts. Fully illustrated booklet featuring newly commissioned essays by broadcaster Matthew Sweet and Dr Helen Wheatley.